It’s the morning of Leg one, and I am grabbing a quiet moment to check in. It has been a whirlwind couple of days. Upon arrival to Bahrain, we found that our boats, sails and gear were stuck in customs – and had been for a week. Eventually they were released – three days before the start. It has been a mad panic to get the masts in, brand new electronics installed and working, and of course the brand new sails set up. With no facilities, such as a workshop or sail loft, it is definitely a “make it work” kind of theme. Onboard is Mary Rook and Liz Baylis, each returning from a previous version of SATT. Ibtisam was with us last year, but never sailed in the offshore legs, so although she understands the nature of the race, the endurance aspect will be new. The rest of the team is brand new, including very novice sailors. Our vision is to continue to train the new Omani women in becoming not only good racing sailors, but also in the qualities that make good teammates and leaders in their own right. Things like ownership, teamwork, processing mistakes and learning from them, resilance, and of course communication. They are excited and have already been taking on the jobs – big or small – on the boat needed to get things done. Unfortunately, we only have about one hour collectively sailing as a total team, and we are facing tough competition. All but one boat is a returning, talented team from previous versions of the SATT. 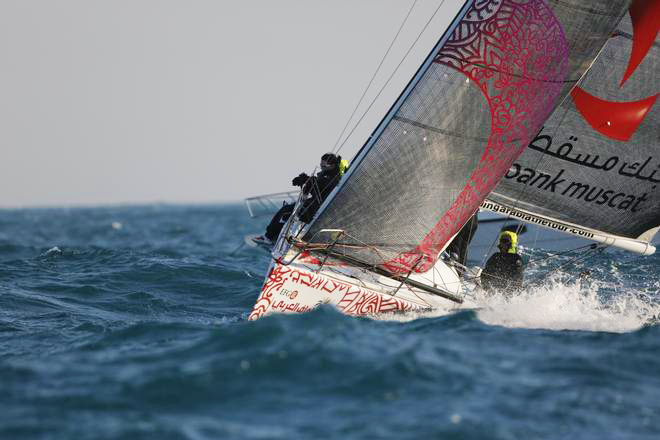 The one which is the exception – EFG Bank, armed with incredible professional talent and two of Oman’s top sailors, and is currently the favorite of the race. The good news is this sets a high bar to work for, and that is good for performance goals. The bad news is that it can be tough on morale if realistic goals aren’t set. Myself and Liz Baylis (who is navigator and tactician) will have to manage those expectations. The calm before the storm – girls stretch and relax an hour before the start of Leg 1. This morning is the opening ceremony with a member of Bahrain’s royal family expected. The weather is rainy and cold however, so he may not come. After that the start is supposed to be at 1:00 pm, with a northwest wind of 20+ knots to send us flying over to Doha, Qatar. I believe the start will be postponed, so we are probably looking at 4:30 or 5:00 pm start. Just a tiny bit of time to sail in daylight before sailing all night in the dark, honing off downwind, turning right at the tip of Qatar. Thankfully, the course is pretty straightforward for the first leg. It will be a short leg, and it will get our team comfortable with off-the-wind sailing and entail a spinnaker peel, which we did practice in yesterday’s one hour of sailing. Looking forward to seeing how we handle the night. RTLI: Katie, you are headed back to Oman for your THIRD year to coach these young Omani women sailors – what have you seen change in the attitude toward the women sailors within the Oman Sail/SATT community? 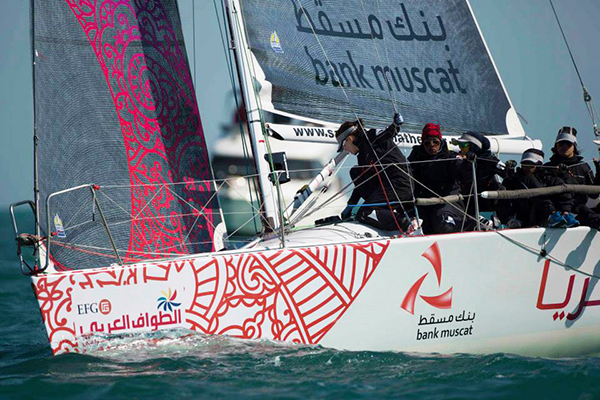 Katie: Oman has continued to rally around and support the women’s sailing effort, and internally watching the women and the men’s team get integrated into a training and sailing regime has been terrific. 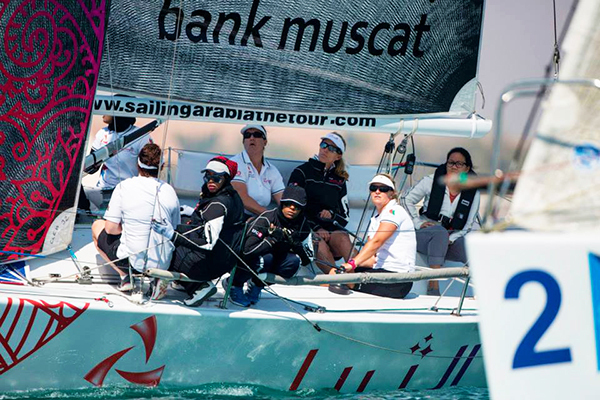 When we first started, the girls were completely separated from the rest of the Omani sailing efforts, as there was not yet a high level women’s racing team. Many people I met in the first year (2012) had doubts that a novice team of Omani women could do this physically demanding competitive adventure. When people saw the Omani women’s team not only survive, but excel – they were excited and inspired by what the women had achieved, so the effort continues. I look forward to seeing this project fulfill His Majesty Sultan Qaboos Bin Said’s vision. RTLI: Dee Caffari has left the Oman women’s sailing program to pursue her dream of co-leading a Volvo Round the World team. This leaves you as leader. What do you see as your biggest challenge(s) as you step into her leadership role with the team? Katie: Dee leaves big shoes! She is a dynamic, empathetic personality that has set the tone and focus from the start – to build the Omani women’s skills. My big challenge will to be to continue to fulfill that mission as the priority, and accept gains in skill sets as a win – even if race results don’t reflect that significant progress. RTLI: Only a few of the Omani women are returning to this year’s SATT team. Who will be the Omani women leaders on the team? What are their roles, and what do you hope they can each achieve individually and as a team? Katie: We only have two returning sailors – Eptisom and Raya. Looking at the girls who have been involved and moved on to other things, the involvement of these women in the program has really furthered their problem solving skills, dedication to hard work and belief in self – which is translating into successful careers and lives outside of sailing. Raya is still sailing, and preparing for a career in Finance – and she tells everyone that she wants to be like me(!) 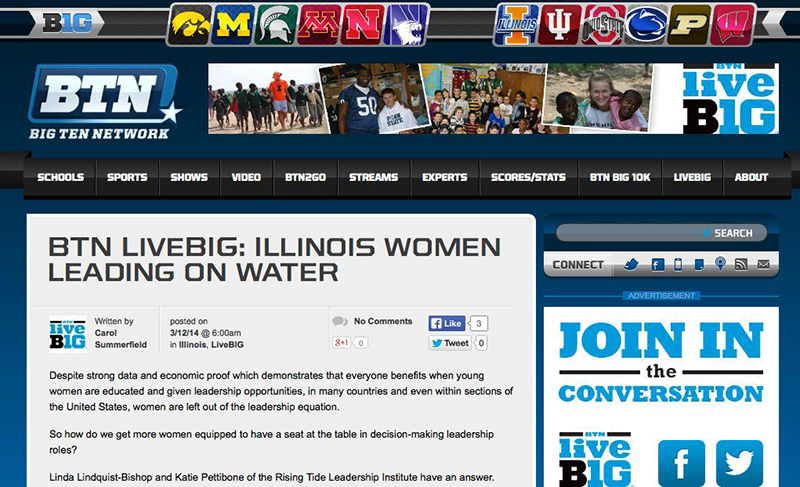 – a strong reminder of how important women leader role models are to young women everywhere. Intisar, who last year won Oman’s first Woman Sailor of the Year award, is now running an athletic program, and deeply believes in women in sports. She is an emerging leader, and will enable many girls to compete for generations to come. Both Raya and Eptisom will help prepare the new women for the pace, requirements of taking care of the boat, and themselves, as well as what is required to be a part of a team. For three of them, this is a first. Both Eptisom and Raya will remember their first time, their doubts, fears and the struggles… and be great mentors to these new young women. I want each of them to leave this experience with a sense of accomplishment, that they learned skills and what it means to truly part of a team. Teaching them the value of team and what it takes to be a great team member is not easy. The concept of ‘team’ is ingrained here in the U.S., in our sports crazed nation. What it means to put something else above self, even if self would benefit from doing something different, is a critical and new concept for these women. Not everyone gets it, and my hope is through this competition the girls can begin to experience and see the benefit, and great joy of team. RTLI: You will have Liz Baylis from the U.S., and Mary Rook from Great Britain, on board helping you coach the Omani’s. What will each of them bring to the team? Katie: Liz brings incredible talent, and also wisdom in teaching new sailors new skills. She is returning as navigator and knows what to expect from the Omani women. With her role as WIMRA (Women’s International Match Race Assoc.) executive director, she understands that this team and effort is planting seeds for long-term growth in yacht racing and leadership opportunities for women in the Middle East. 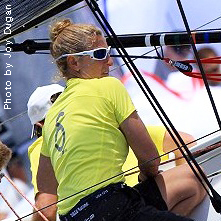 Mary Rook is a young Olympic sailor from Great Britain who is fiercely competitive, and has an amazing can-do attitude whether she is showing the girls how to jibe the pole on the bow or trim a spinnaker. I refer to her as my ‘fire fighter’ since she will be the trouble shooter on board. The girls look up to both Liz and Mary, and they relate to Mary because she is close to their age. RTLI: As you prepare to board the plane to Oman what are some of the thoughts and emotions going through your head? Katie: Heading to Bahrain – preparing for the long flight. 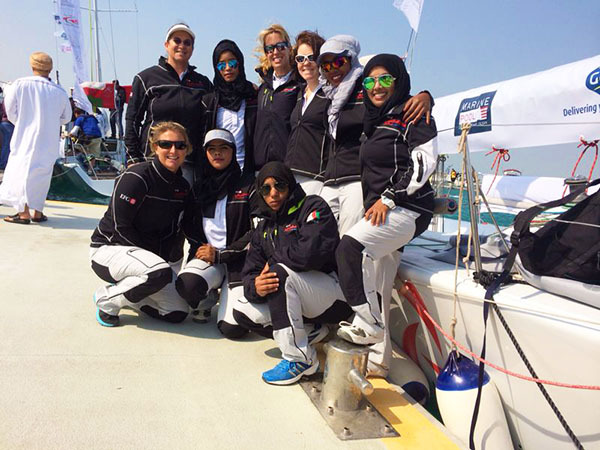 I am excited to compete in the race with the team and eager to see how this new batch of Omani women sailors fare. Sprint Offshore racing is hard. It is the hardest, in my opinion, because you can’t get into consistent routines and it is tremendously physically and mentally demanding. I think this young team has tremendous growth potential, and at the end of SATT 2014, I want to instill in them the satisfaction of a job well done… of completing a journey, and to be able to look back on everything they have learned. My challenge is to translate the depth of knowledge I have gained over decades, to lessons on the water that are impactful and immediate, so they can make rapid improvements in this short time of the event. This is just the beginning of Oman Sail’s great project and sporting adventure, that will reap huge benefits as those who gain technical, team and leadership skills succeed in sailing, and then go on using those new skill sets, to be successful in business, politics or in whatever they choose to pursue!